Using German money to bail out southern Europe has been a hugely controversial subject in Germany - and one that most politicians are trying to avoid ahead of the 22 September general election. But Germans have been on the giving - and receiving - end of such financial support before. When East and West Germany reunited, the West spent huge sums attempting to bring industry and living standards in the East up to parity. So how sympathetic are East Germans to the plight of indebted southern Europeans? 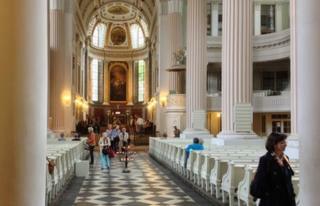 With its white interior and elegant pillars, the Nikolaikirche is a peaceful retreat in Leipzig's busy city centre. But in 1989, the church had become a meeting place for disillusioned East Germans who wanted change. Birgit Scheffel speaks with passion as she recalls taking part in those protests, which began as Monday prayers. "East Germany was in a dark and hopeless place. They promised us a workers' and farmers' state - now they wanted to shoot us down". By the time the GDR collapsed, Leipzig had become a dilapidated industrial city. Much of the area's inefficient industry soon closed down. "Eighty thousand jobs disappeared," says Gerhard Heimpold of the Halle Institute for Economic Research. Even now, the manufacturing sector has not recovered to the size it was then and it makes up a much smaller proportion of the economy than in West Germany. But compared to the rest of the former East, Leipzig is prospering. Today, the city is an appealing mix of old and new, with coffee shops scattered around cobbled squares. A service sector has developed in the area and Mr Heimpold lists the major companies that have opened sites around Leipzig. "In 2002, Porsche built a car plant here, in 2005 it was BMW and in 2006 Amazon established a distribution centre here." Lothar Huether, technical manager at Future Electronics, is extremely proud of his clean, hi-tech, automated plant which packs and distributes electronic parts to companies around the world. More than 130 people are employed here and it epitomises the success of Leipzig. The regional government made it very attractive for the company to choose to locate in Leipzig, says Mr Huether. But others are drawn by the investment in infrastructure. Leipzig has a modern airport, good road connections and a beautifully restored railway station. EU funds, as well as money transferred from West Germany, have helped to pay for this renewal. But does this recent history of economic crisis and recovery make the people of Leipzig and East Germans generally, more sympathetic to the plight of their debt-stricken neighbours in the eurozone? Wilhelm Althammer, Professor of Macroeconomics at the HHL Graduate School of Management in Leipzig, thinks not. "Unfortunately, I think there's even less sympathy in East Germany than in West Germany," he says. This is because the East Germans do not share the same legacy of post-war European integration as the West. Dirk Panter, a local member of the Social Democratic Party, agrees. His party was founded in Leipzig 150 years ago as the General German Workers' Association. In this election, it is trailing Angela Merkel and her conservative Christian Democrats. Mr Panter admits Peer Steinbruck, who is challenging Angela Merkel for the chancellorship, faces a tough challenge. And he insists that, despite the German public's apparent unwillingness to spend more money on the struggling members of the eurozone, his party would take a more sympathetic stance. "We should be more aware of how Germany was helped after the Second World War, and should have that in mind when we talk to other European countries" he says. But he has sympathy for the public's view: "Who likes to spend money on others?" But during the campaign, all sides have tried, as far as possible, to avoid discussing the future of Europe or the eurozone aware, perhaps, that there are few votes in it. At the Nikolaikirche, Birgit Scheffel says she, too, is sympathetic to the plight of her fellow Europeans, but dismisses comparisons with the Germans who emerged from the Stasi-dominated GDR. "In southern Europe it's about the economy, and their protestors are violent. We weren't violent; we wanted more than only money. We wanted freedom."